I'm pretty sure everybody has heard the term "toe-in" and that we all know that it's something that needs to be adjusted for you kart to handle properly. But just what that adjustment should be, and how to set it, are, for many karters, a lot less clear. Let's take a few minutes and look at the factors that determine what the toe-in (or toe-out) setting should be, and how to make sure we get it there. In brief, toe-in is exactly what it sounds like: the amount the front tires are closer together at the front edge than they are at the rear edge of the tire. From a purely straightaway speed perspective, it would seem that running zero toe-in would give the least tire scrubbing, the least drag, and the maximum top end. But virtually every chassis manufacturer recommends dialing in some small amount of toe-in. Why is that? And are there ever conditions when you'd want to run toe-out? How much toe-in is too much? Most of the answers to these questions are based on the geometry of the front end of the kart. Modern race karts virtually all use between 9 degrees and 15 degrees of castor in the spindles. That is, the kingpin lays back from the vertical on each side. That means that when you turn the wheel to the left, for example, as the left side tire moves back, it also moves down. That's the major source of the corner to corner weight transfer that helps the kart turn. "Fine," you say, "What does that have to do with toe-in on the straightaway?" Well, as you go down the straight, the steering constantly moves left and right a tiny bit as the tires track over irregularities in the surface. Setting in a little bit of toe-in helps keep the front of the kart from weaving as it goes down the track, "hunting" it's called. I know it's hard to believe that just a 1/8th, or even a 1/16th of an inch will help keep the kart from "hunting," but it will. Of course, you don't want to run any more than necessary, because more toe-in generates more tire scrub and cuts down on your chute speed. I can't recall any manufacturer or tuner recommending more than 1/8th inch toe-in, usually a lot less. If we know, then, that a little bit of toe-in helps keep the kart stable on the straights, what happens in the turns? Increasing toe-in increases the slip angle on the outside front tire. The slip angle is the difference between the direction the tire is pointed and direction it is actually moving. Increasing the slip angle increases the front cornering force and, consequently, moves the kart towards an oversteer condition. Conversely, reducing toe-in, or even going into a toe-out configuration decreases the slip angle on the outside front tire, decreases cornering force in front and induces understeer. Setting the toe-in properly is vital to proper chassis performance. With the dimensions being so small, making toe-in adjustments correctly is critical. There are lots of devices on the market to make the job easier and more precise, but you can do it without anything more than a tape measure and a screwdriver. With the kart up off the track, on a stand or whatever, give the front wheels a hard spin, one at a time, and scribe a straight line on the tire with the screwdriver on the face of the tire as it spins. This is easiest with new tires, but if you do it with tires that have been on the track it will help if you clean them off first. Now you can carefully measure the distance between the line on the left tire and the line on the right tire. Whatever amount the lines at the front of the tires is closer together than the lines at the rear is the amount of the toe-in. The biggest mistake lots of karters make when setting their toe-in is that they don't take into account the change that occurs when the driver's weight is in the kart. Putting the driver in the kart flexes the frame down, taking the lower steering shaft support with it. That effectively makes the correct distance between the steering arm on the steering shaft and the steering arm on the spindle longer. Since the tie rod didn't magically change length, the kart is now toed-out, relative to where you set it on the stand. 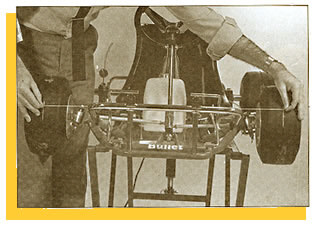 You can do the experiment and determine exactly how much it changes on your kart with your driver's weight, and then just remember to apply that correction factor every time you set or check the toe-in on the stand. But a better policy is to get in the habit of checking the set-up with the kart on the ground and the driver in it. I can't tell you the number of times I have heard karters complain that, even through they set the toe-in right where the manufacturer or their dealer told them, their kart wandered down the straights and understeered in the corners. You can almost bet they set the toe-in on the stand and never thought that it might change. So pull out the tape measure and make sure you've got the toe-in set-up properly. Remember, if you want to get to the front, you've got to point the kart there. See you next month.